Who doesn’t love good six word stories? They are short and sweet. I am so lucky to be able to visit classrooms and hang out with kids. As a writer, there’s nothing more valuable than learning from and listening to your target audience. So when I had a chance to go into my son’s sixth grade class, I decided the topic would be “brevity.” Now, I didn’t tell them that, but it gave me a framework. First, I read a short but very skillfully done picture book. You’re never too old to read a picture book and really learn about the essence of story. A picture book needs to tell a story in very few words. Then, we worked on a 26 word alphabet story about sixth graders. There were some funny parts, like when we included eating and farting. We had tech, including iPhone, video games and memes. One girl suggested we delete “sleeping” and write “Zzzz” – which was GENIUS. We had a lot of sports like gymnastics and karate and soccer. Finally, we got to dessert: the six word story. As I took them through the first two parts of the visit, I explained how stories build to a climax of emotion and action and then offer a resolution. 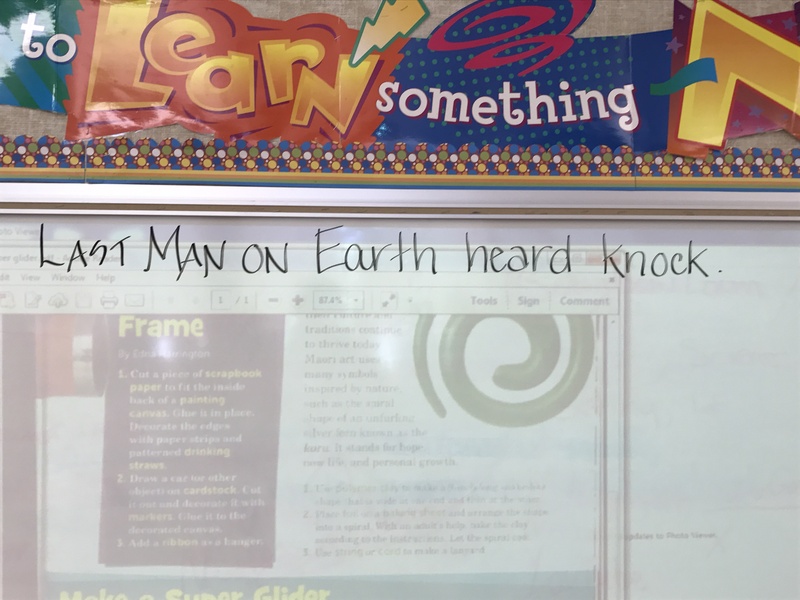 I challenged them to include all of those elements in their six word stories. 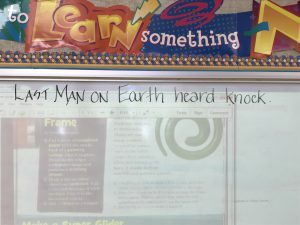 Last man on earth heard knock. I am cool, you are not. Roasted, toasted marshmallow on the fire. I really loved hearing their stories. And since the main character in my current project is in middle school, I decided to write some six word stories for her. She quit everything, until she didn’t. She botched everything except dreaming big. Do you agree that a lot of six word stories sound so ominous? I love to laugh and have fun and wanted to write a humorous six word story. Apology accepted. Now explain the bird. 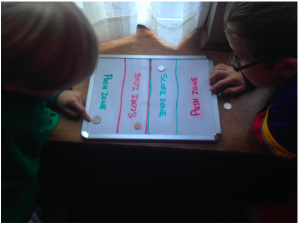 Coin Capture is a fun game that can be played on a rainy day with easy to find household materials. It also gives the players a chance to do some simple math and can be played over and over again. It’s fun for adults and kids to play together. Players try to push their coins into their Score Zone. 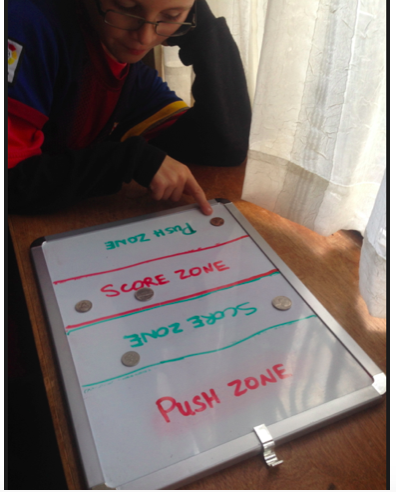 Players earn points based on the value of the coins from their team that land in their Score Zone. The player with the most points wins! Use a ruler to find the middle of the white board. Draw a two lines, one of each color, down the middle of the board. 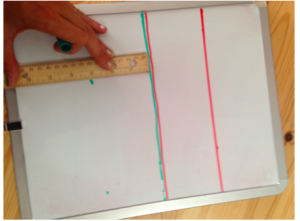 Use the ruler again to divide the two halves of the board into equal sized zones. 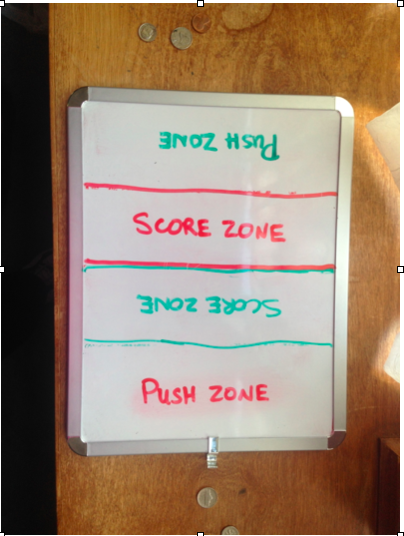 Mark off the Score Zone and Push Zone for each color. Each player gets four coins, 1 quarter, 1 dime, 1 nickel and 1 penny. One player uses heads, one player uses tails. Flip a coin to decide your color and Score Zone. Start in your Push Zone and try to push your coins into your Score Zone. Don’t take coins off the board until the game is over! They will get bumped and pushed around into different zones. Coins on the middle line don’t count for points but can be pushed into a Score Zone. If your coin stops in the other player’s Push Zone, they get to capture it, flip it to their team, and use it. 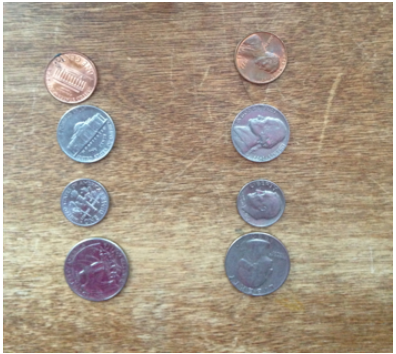 A penny is 1 point, a nickel is 5 points, a dime is 10 points and a quarter is 25 points! When all of the coins have been pushed add up the amount of your coins (heads or tails) in your Score Zone and see who wins. 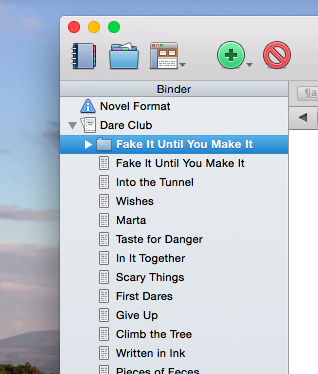 Scrivener is great, isn’t it? Scrivener is really hard to learn, isn’t it? I can’t really learn and retain lots and lots of information just by reading it one time. I need to use the information in some way or else I find I have a problem and learn by finding the solution. 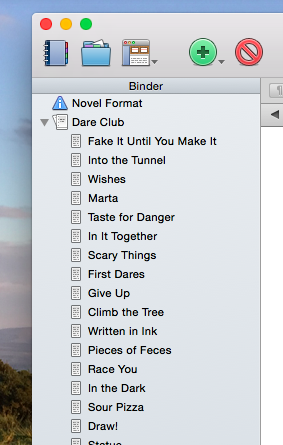 My most recent problem was that the chapter titles for my novel manuscript weren’t appearing in the Compile document. I struggled with this for awhile. I did Google searches. I asked people on Twitter. I asked two smart, curious people who are good at problem-solving and debugging. I did more Google searches. Finally, after some continued struggle and putting the question away and then coming back to it, I re-read the block of text at the intro screen within Scrivener. Turns out I needed to not work in folders. 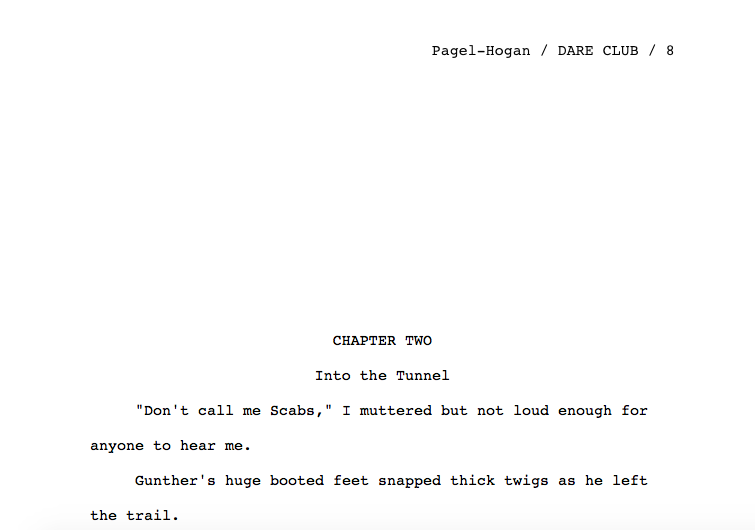 I didn’t want to make multiple scenes. I just wanted to write chapters. So I thought that meant write in folders. But that was wrong. 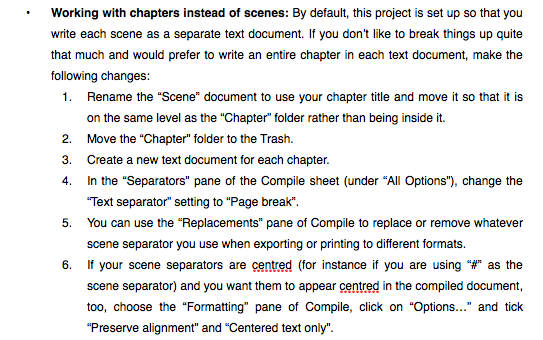 Based on the intro screen info, I needed to create text files and move those text files up to the chapter level. So I went through every chapter and created a text file, copy and pasted the words into the new file, then deleted the folder. Then I went to the Compile screen. Guess what! All of the chapter titles I wanted were highlighted in yellow! WOOO!!! I hit Compile. And when I checked out the document, all of my chapter titles were right where they should be! 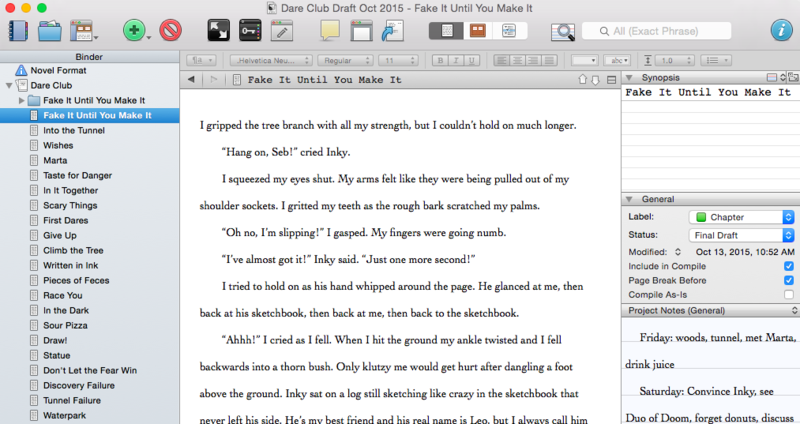 While I really enjoyed using Scrivener to work on my novel manuscript I am by no means a power user. There are so many features I haven’t even begun to explore. I’m about to work on a non-fiction picture book proposal and I believe I will learn even more about the features of Scrivener as I encounter problems or want things to look a certain way and then learn how to make it happen. 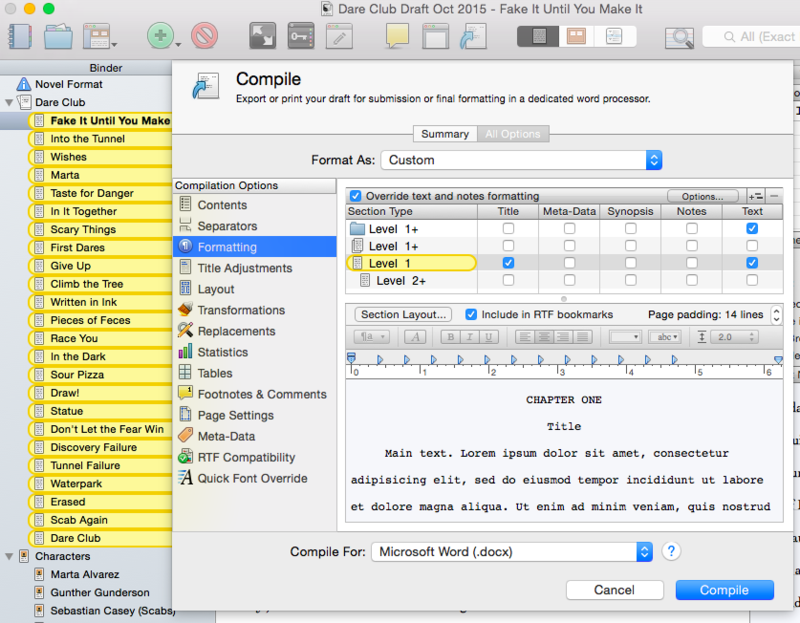 What feature of Scrivener did you learn through problem-solving? Which feature is your most favorite? I’m not sure what’s in store during the dog days of summer, but I definitely went through a “spring slump.” In early May after the completion of some big road races and writing conferences. Although I had plenty on my plate and managed to meet the deadlines for client projects, I wasn’t feeling the love I usually need to boost my own projects. I didn’t fight the slump. I slid into it. And then after an indecent amount of time slumping, I slid back out. Right at the time my laptop suffered water damage. So there I was without my main means of creativity just when I’d managed to wake up my muse. I’ve got my laptop and my energy back. And I’m tapping into two things that help me make good things. I’m hitting halfway on my book reading goal and it’s day 180 out 185 in the year. I’m running again and boosting my energy. 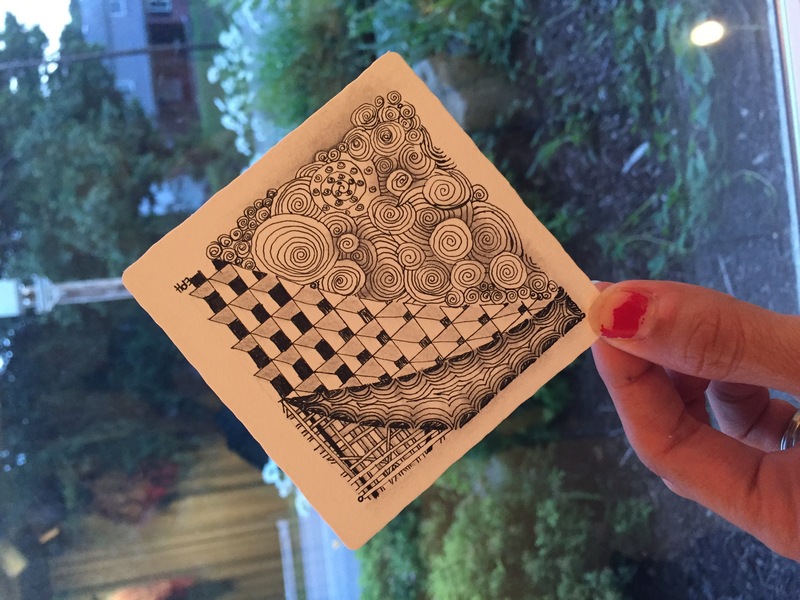 I signed up for an art class called Zentangle that truly allowed me the chance to create a lovely little piece of art and reinforced my feelings of positive accomplishment. How do you boost your creativity? I am a sucker for a writing contest. I have a writing friend who thinks they can be a real waste of time and money, and I acknowledge that she is very right most of the time. 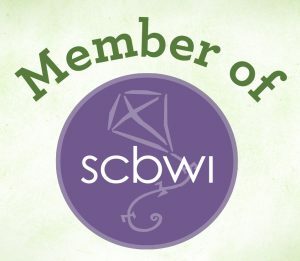 But after a recent meeting of my SCBWI critique group, and after the experience I gained from one contest, I have identified some intangible benefits. But to be fair, I will outline some of the negative aspects of writing contests, too. This is hard because I’m not good at seeing the downside of things. There is usually a fee. The word count may not lend itself to the best telling of your story. Winning an award doesn’t always mean publication of your writing. It could be a scam. The fees for some are very small. Word count limits can force you to revise. It’s good practice to have to meet a deadline. Some contests promise feedback that you don’t get on regular submissions. I’ve been writing for a long time, all the way back to when I started my elementary school’s first literary journal. Yes, as editor several of my more painful pieces of poetry were chosen for the first issue. But since then my fiction success has been pretty low. In college and as an adult I wrote for several newspapers. But my short stories only earned rejections. It hurt but I kept writing. Then last year, as I continued my habit of entering writing contests, something changed. I earned an honorable mention for a poem, a finalist position for a flash fiction piece, and an honorable mention for another flash fiction story. These were my first writing awards, ever. And that last honorable mention includes publication in a respected sci-fi/fantasy magazine! My first fiction publication. Ever. There is no prize money. The editors asked me to revise my story slightly. That was good practice. The editors asked me to review and sign a contract. I was excited to learn what was in the contract and research the meaning of the rights. The editors asked me to review their copyedits. This was good learning, too. I’m following the magazine on Facebook and learning about how they tagline the stories in each issue. This story was originally written before I had children, and I had pulled it out and re-worked it. I have lots more of those and feel like I am a better writer than I was then. I can make them, better, faster, stronger. If you want to enter a writing contest, I would say go for it. But go for it in a smart way. Do your research. I picked journals that printed things I loved to read. So find a literary magazine or journal that you respect. I have two favorites that have contests on right now and I saved up some of my best work for their contests! Do not just enter any old contest. I often look for contests with unique angles like ‘Best Starts’ or with themes and prompts. Pick the right writing. Chose stories or poems you have written that you think they would love. Don’t enter contests with excessive fees. I consider anything above $20 excessive. Think small. Lots of really big magazines like Writer’s Digest and Poets & Writers offer contests. But smaller journals and magazines host them, too. Sign up for alerts from places like WOW! Women on Writing, Writer Advice, FreelanceWriting and AllIndieWriters. If you’re looking for guidance or training on how to boost your freelance career using social media, this is the bootcamp for you. Sign up before all the spots are filled! Jennifer Bright Reich is the author of six books – all self-published- including the very popular Mommy MD Guides and owner of Momosa Publishing Company. Here she offers her recipe for success and reminds us that it takes time to bring any big project to life. Is self-publishing right for you? Why did you choose to self-publish? My coauthor, Rallie McAllister, MD, MPH, and I decided to start our own publishing company so we would have creative control over our books and so that we could create a team of talented writers, editors, designers, and indexers and help to support their businesses as well. How long did you work on this project from idea conception to print reality? It took us nine months to create The Mommy MD Guide to Pregnancy and Birth from start to receiving printed books—just like a “real” baby.” We stretched our schedule to 11 months for The Mommy MD Guide to Your Baby’s First Year, The Mommy MD Guide to the Toddler Years, and The Mommy MD Guide to Losing Weight and Feeling Great, which is “due” September 2013, to give us a bit more wriggle room. Was there a mistake you made/almost made that taught you something significant about self-publishing? Our nine-month schedule for The Mommy MD Guide to Pregnancy and Birth was achievable, but challenging. So that’s why we gave ourselves more time for our other books. 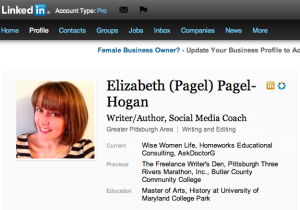 Would Your Remove Skills from Your LinkedIn Profile? Sure you would – and should – if they don’t describe the kind of work you are doing and want to do. LinkedIn can be a fantastic resource for connecting with potential clients, resources and partners. A good review of your social media profiles is essential when you’re hoping to make the right kinds of connections and do your best by your customers. Take a look at your own LinkedIn profile and make sure the skills you’re listing are exactly the ones you want to promote. Even if you’re not seeking employment, LinkedIn can be a fabulous way to stay on top of industry trends, changes in corporate leadership, raging debates on current affairs and – my personal favorite – an excellent source of solutions for problems your business faces day to day. I use LinkedIn Answers at least twice a month to solve or problem or find a new way to complete an old task. Another great resource available on LinkedIn is SlideShare that allows users to showcase their best presentations and attract the right kind of audience. My most recent upload has received 80 views in 4 weeks. It really showcases my perspective and brand. What presentation would convey your essential messages? If LinkedIn isn’t one of your favorite social media sites, maybe it should be! 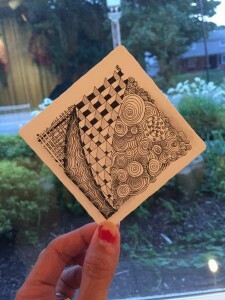 Connect with me and grow your skill set!